This extremely comfortable Gearhart chair, folds for easy storage and complements all of our dining tables. 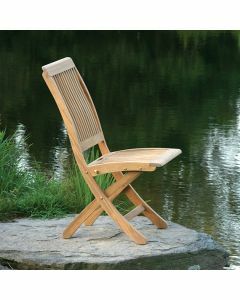 The chair measures 19.5"W X 19"D X 35"H. Check out the coordinating Gearhart Dining Armchair. This item does have an optional cushion available.The cushion is available in a variety of fabrics. Please click this link to view the fabric choices. Please note each fabric grade has a different cost. Please choose the fabric grade from the drop down menu and enter the number and name of the fabric in the space provided. Please contact Customer Service with any questions. Click on images for greater detail. *The chair is shown with Kingsley Bate Essex Bistro Table. Click HERE if you wish to buy Kingsley Bate Essex Bistro Table.